A fuzzy rug or hammered brass pendant lamp—basically anything that looks like it was picked up at the souk (even if it was just a trip to World Market)—adds a sophisticated note to an other wise simple interior. Desert style is all about being simple, earthy and warm. 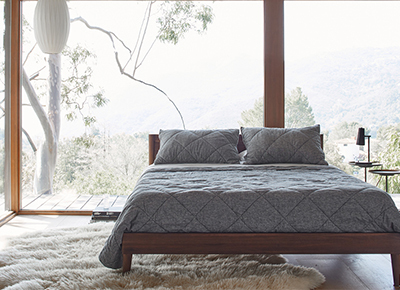 So forgo any fabric getting between you and the great outdoors (but maybe hang simple blinds if the hills have eyes). Available in a wide range of earthy hues, leather couches are a signature desert decor element. Practically indestructible, they look cooler the more worn-in they get. A colorful kilim rug used as upholstery on a bench or ottoman adds texture without looking too “done.” And, like leather, it’s way durable. An entry table, desk or banquette that’s attached to the wall is a design feature that bigwig mid-century architects loved for its usefulness and sleek lines. Today it’s just as practical and attractive to have fewer skinny legs breaking up a room’s visual flow. An open-weave rattan swing chair or even a hammock in a quiet corner creates a focal point for the room that reminds you to chill out, even if you don’t have time for a full-on siesta.